1. See what you want. You chose the data you want to view/edit which makes life easier. I know it sounds odd yet by using the form’s underlying datasource and link it to the report, there is no need for daily/weekly/yearly reports. One report fits all! Entering multiple criteria in an unbound form is ways easier than applying filters. Controls are used for all: view/add/edit/search. While I agree with anyone that unbound forms aren’t a necessity, it pays off big time when it comes to data analysis (CRM, analysis, stats). If you are referring to web database available with Access 2010 and Access 2013, they do have bound forms that works even in web browser, so there is no need for unbound forms. But if you’re thinking a generic web application made using PHP or ASP.NET, then you’re going to have to refit the application entirely and you probably can’t use any code from VBA used to manage data access anyway. You’d be dealing with entirely different object models. But maybe I’m missing something? Can you elaborate? Can we use database Acces (.mdb) as the front end and use the SQL Server as the back end? How can we do that? I’m going to have to disagree. 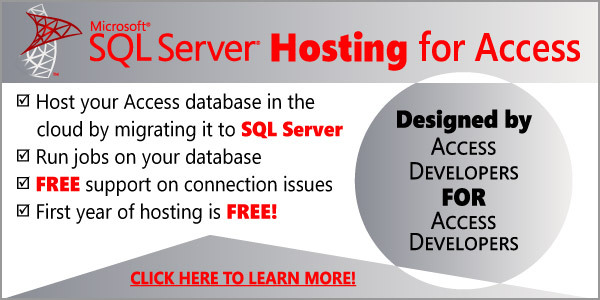 I have recently started moving 20+ access databases to SQL server. I store the connection string and all of the SQL commands it’s to run in tables in the access file. I then write functions that will execute those SQL statements or return a recordset as a string that I can drop into a value list for a listbox or combo box. Yes, it’s more work to get set up but the performance is incredible. Also, using this method I do not have to manage DSNs on the client machine (which in a company spread over a 3 building campus would be a huge ordeal). Another advantage to this method is that when moving it from a dev to live environment I merely have to change the connection string in the table and do not have to do any re-coding. From a maintenance standpoint, it’s not a lot of work. Changing the behavior of the app isn’t any different than it was before. And if I need it to do something server side, I merely write the SQL statement in Studio, drop it on the table in the Access file and then call it in my code when I need it. I have also noticed a substantial drop in Access file bloating. Don’t have to do nearly as many compact/repairs. It proves there are major benefits to unbound forms but as you mention, there is work involved to make it transparent to the user. I’ll be writing a series of post on how to manage DSN-Less apps starting next week, look forward to your review on it.